After eighteen years of writing and making things to little avail, the presentation at Electric Works was like arriving at a forgotten destination. Me in front of people talking coherently about something I created? It doesn’t sound like the reality I know, yet according to multiple reports, that is what happened on Sa³ Jan 19 here in San Francisco. 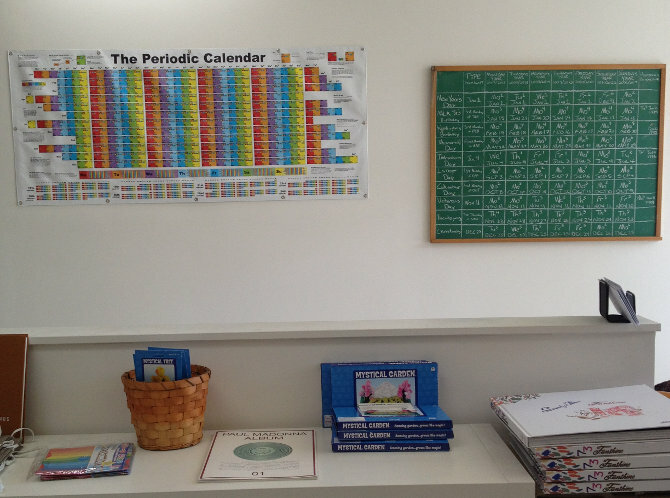 What I can objectively confirm is that the 6 foot vinyl banner of the Periodic Calendar was a mighty sight to behold. Also, my chalkboard display breaking down how many three-day weekends the federal holidays yield in the seven types of years completely betrayed the fact that my handwriting is generally a poor show. And look, … people! … Awake people! 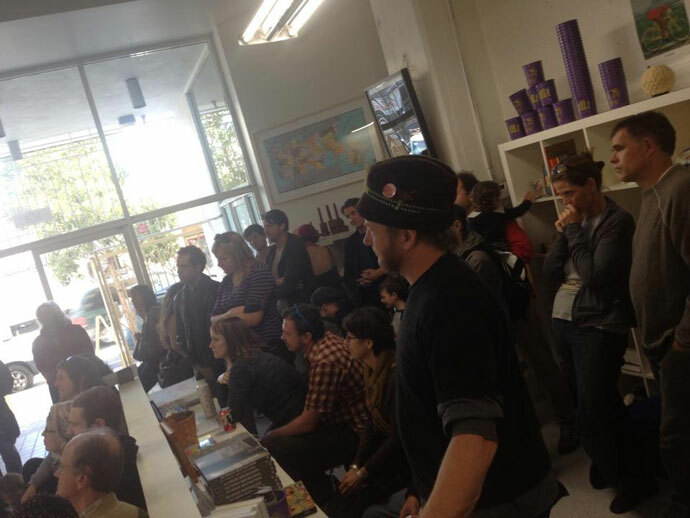 … It was standing room only! Of course that picture was taken before the crowd got angry and started chanting “Heretic!” while throwing fruit and vegetables at me for claiming that there are 438 elements representing 365/6 so-called days. … Aside from that however, the audience remained not only friendly and alert, but were brimming with questions about the inner workings of the Periodic Calendar. Thanks again to everyone who came out and to Electric Works for hosting this inaugural event. Based on the interest in what has been unearthed about the calendar in the first few weeks of its existence, it seems I’m not alone in thinking the Periodic Calendar has some surprising and perhaps even valuable insights and perspectives to offer the world. I look forward to sharing more, both in person and here on the site, as we continue to explore this new way to look at time. Meanwhile, we wait with baited breath to find out what the San Francisco Chronicle, who was also in attendance, thought of the proceedings. Check out the SFiS section of the Su1 Feb 3 paper to read the verdict!